How to Handle Excel File Full of Tags With SDL Trados Studio? By taggy files I mean “embedded xml or html content” that is written into an Excel file alongside translatable text. Translators and Technology: Friends or Foes? It is a fact that different kinds of technology creep into the translation industry on all levels. As a result, some participants in this magical process of transforming a text to fit a different language, cultural, and sociological community, can feel quite uneasy, or even anxious. Will machine translation (MT) reach parity with human translation (HT)? Will there be a need for translators? Read full article from here. CAT tools have already been on the market for many years now and yet they are still improving. New technologies and emerging needs from translators are triggering a shift from computer-aided translation tools to smart device-aided translations tools. Does the future of productivity lie in web-based translation environments? While CAT tools nowadays are inevitable in the toolkit of translators, it is still not long ago that professional translators had to work without them. The tools for computer-aided translation, not to be confused with online translation tools like Google Translate, only emerged in the early 1990s. Although there might have been some earlier attempts to create software that helps translators to improve their quality, productivity and consistency, in the last decade of the last century they came into full swing. Nowadays translators can choose from at least 20 different CAT tools, both online and offline, to suit their needs out of which SDL Trados and MemoQ are by far the best known. However, only 25 years after the introduction of mainstream translation software a new era is on the horizon. The introduction of cloud technology, the rise of digital nomads, and the general availability of cheap and fast internet connections has led to a new branch on the CAT tool tree: translators can now use online translation environments, both free and paid, to work wherever they choose to. The technological advancements in the last couple of years opened great opportunities for companies who looked beyond traditional CAT tools and wanted to pluck the low-hanging fruit of the cloud’s capabilities. Several professionals, both from inside and outside the translation industry, quickly introduced their own online variants of the desktop translation tools. Examples included Smartling and Memsource (which has a desktop tool as well). These tools are browser-based, which means that they are accessible as webpages and can be used to work wherever users want as long as they have a compatible device and an internet connection. The online translation environments offer full functionality, which is often equivalent to the standard desktop tools. Users (in the case of Smartling and Memsource mainly project managers) can create translation memories and term bases, set rules for quality assurance and require users to perform several checks before they can deliver their translations. The tools also offer support for the most common file formats, like Microsoft Office files, PDF files and HTML documents, but also for bilingual filetypes like XLIFF and the proprietary formats of Trados and MemoQ. In addition, they often have familiar user interfaces, with well-known toolbars and panels that make it easier for project managers and translators alike to find their way in the online CAT tool. It might be clear that the new members in the CAT tool family are working disruptively to shake up the CAT tool industry. It is therefore not a surprise that after the introduction of new online CAT tools developers of ‘traditional’ CAT tools also came up with an online version. MemoQ introduced MemoQ Web while SDL brought SDL Online Translation Editor to the table. The most important feature of the web-based CAT tools is, (how surprising), that they work in a browser. Most of them were initially designed to work on a desktop, offering translators a convenient tool with omnipresent accessibility while at the same time making it easier for project managers to dispense projects. Indeed, project managers only had to upload files, create or connect a translation memory, and send a link to multiple translators, making it easier to complete projects, shorten the turnaround time, and circumvent lengthy discussions via email. But because these new online CAT tools were mainly directed at agencies and project managers, they fell short of meeting the needs of translators who wanted to work on the go. Other bright minds therefore developed new web-based CAT tools that supported the needs of the freelance translator better: in the past few years Lilt and Smartcat were introduced, among others. The SDL Online Translation Editor has also been created with freelance professionals in mind, while MemoQ Web is more dedicated to project managers. The biggest difference between tools for freelance translators and project managers is their workflow. 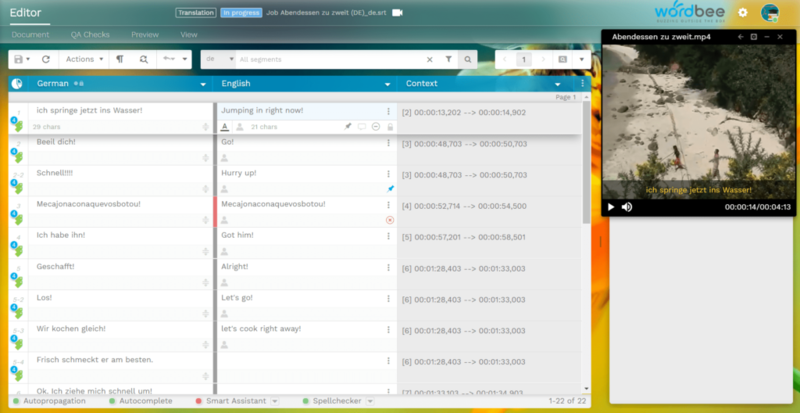 While project managers have loads of options to manage projects, tools like Lilt and Smartcat introduce only the options freelancers need: they can upload a file in different file types, create or use a translation memory (term bases are often not supported), work their way through the file, and complete the job. The tools have a familiar and simple user interface, so translators do not need to look for advanced options, but often, powerful options are hidden under the bonnet, so they can really compete with their desktop equivalents. Another major advantage of CAT tools in the cloud is that they frequently release new features quickly and respond to feature requests even faster, while traditional CAT tools often require months for implementing, testing, and introducing new features in a newly built (minor) version of their tool. Another major difference is that many tools aimed at freelancers are free to use. They offer various plans for advanced users, often based on the amount of characters being translated, but there is only one free flavour, and it comes without many of the options that paid users have access to. In the past few years the online CAT tools have quickly risen to the level at which they can compete with traditional computer-based CAT tools. Where CAT tools have evolved and added new features with every new release, their online counterparts were introduced according to the status quo of traditional CAT tools. They sometimes even introduced ground-breaking new features that traditional CAT tools were not able to offer, like Lilt’s adaptive machine translation. Yet among translators there is still much debate about their adaptations. The most important concern is that of privacy. While computer resources are generally considered a safe option, many translators are afraid to use cloud environments because of the risk of hacks and leaks that expose clients’ confidential information. At the same time, using a free online translation environment sometimes requires that translations are shared with the platform provider to improve the quality of generally available translation memories and machine translation services. Freelancers, whose business depends on credibility, simply cannot afford to share their client’s information for the sake of improving their productivity or flexibility. On the other hand, early adopters and technology enthusiasts debate that the cloud is much safer than many computers thanks to continuous security updates. However, they are only a small group in the world of translators. Whatever the privacy concerns, until now the introduction of online CAT tools has made clear that they are here to stay. With the increasing adaptation of online tools, lifestyles shifting to working on the go, and digital nomadism it is expected that online translation environments will be increasingly in demand in the future. Although traditional CAT tools do not offer any opportunities to be run on smart devices with an Android, iOS, or Windows Phone operating system, online CAT tools do not have this problem. That means that they can be used without barriers on smartphones and tablets, once they have been adopted on a computer. Indeed they offer the same experience everywhere as they are browser-based and do not need to be adapted much to work in different operating environments. An added advantage of this possibility is that users can start a task on their desktop, then work on it while away, and complete it in a third environment. Yet, despite the seemingly endless possibilities of the online CAT tools, many of them still do not offer a flawless experience on smartphones and tablets. One of the biggest disadvantages of the browser-based tools is that they do not fit neatly onto the small screens of smart devices. A short experiment with a few translation platforms (Smartcat and Lilt; SDL’s Online Translator Editor returned an error) quickly showed that the user interface has problems with touch-enabled devices. While all elements of a CAT tool (the panel with the bilingual format, a panel with translation memory results, a concordance panel, and some other interface elements) are present, they often do not fit neatly. While the interface appears fine in its initial state, touching a text box to add a translation will cause the panels to be re-arranged every time. Furthermore after touching the screen the screen keyboard pops up, often making (a part of) the source text invisible. While this problem is apparent on tablets, it is even more problematic on smartphones with even smaller screens. Working on a translation on the go using a tablet of smartphone therefore does not offer a seamless, flawless, or productive experience just yet. Another problem is that rendering the translation environment on a tablet or smartphone requires considerable computing resources on some devices. So in order to make full use of an online CAT tool, users need to have a powerful tablet or smartphone that can execute scripts and render style sheets quickly to realize a productivity gain. That brings us to the question of whether online CAT tools can fulfil the needs of professional translators. Basically, the answer is yes. Online CAT tools often work well on desktops. However, they are currently an online variant on computer-aided translation tools. That does not mean that they are fully fledged to become smart device-based translation tools (SAT). The current generation of browser-based CAT tools is perfect to use with laptops while one is on the go, but in order to benefit from their full potential for smartphones and tablets they still need to be more adapted to these devices. The future of CAT tools is in our hands, but it still need to be adapted to our fingers. Machine translation (MT) is automated translation by computer software. MT can be used to translate entire texts without any human input, or can be used alongside human translators. The concept of MT started gaining traction in the early 50s, and has come a long way since. Many used to consider MT an inadequate alternative to human translators, but as the technology has advanced, more and more companies are turning to MT to aid human translators and optimize the localization process. Well, that depends on the type of machine translation engine. There are several different kinds of MT software which work in different ways. We will introduce Rule-based, Statistical, and Neural. Rule-based machine translation (RBMT) is the forefather of MT software. It is based on sets of grammatical and syntactical rules and phraseology of a language. RBMT links the structure of the source segment to the target segment, producing a result based on analysis of the rules of the source and target languages. The rules are developed by linguists and users can add terminology to override the MT and improve the translation quality. Statistical MT (SMT) started in the age of big data and uses large amounts of existing translated texts and statistical models and algorithms to generate translations. This system relies heavily on available multilingual corpora and an average of two millions words are needed to train the engine for a specific domain – which can be time and resource intensive. When a using domain specific data, SMT can produce good quality translations, especially in the technical, medical, and financial field. Neural MT (NMT) is a new approach which is built on deep neural networks. There are a variety of network architectures used in NMT but typically, the network can be divided into two components: an encoder which reads the input sentence and generates a representation suitable for translation, and a decoder which generates the actual translation. Words and even whole sentences are represented as vectors of real numbers in NMT. Compared to the previous generation of MT, NMT generates outputs which tend to be more fluent and grammatically accurate. Overall, NMT is a major step in MT quality. However, NMT may slightly lack behind previous approaches when it comes to translating rare words and terminology. Long and/or complex sentences are still an issue even for state-of-the-art NMT systems. So now you have a brief understanding of MT – but what does it mean for your translation workflow? How does it benefit you? MT is incredibly fast and can translate thousands of words per minute. It can translate into multiple languages at once which drastically reduces the amount of manpower needed. Implementing MT into your localization process can do the heavy lifting for translators and free up their valuable time, allowing them to focus on the more intricate aspects of translation. MT technology is developing rapidly, and is constantly advancing towards producing higher quality translations and reducing the need for post-editing. There are many advantages of using MT but we can’t ignore the disadvantages. MT does not always produce perfect translations. Unlike human translators, computers can’t understand context and culture, therefore MT can’t be used to translate anything and everything. Sometimes MT alone is suitable, while others a combination of MT and human translation is best. Sometimes it is not suitable at all. MT is not a one-size-fits-all translation solution. When translating creative or literary content, MT is not a suitable choice. This can also be the case when translating culturally specific-texts. A good rule of thumb is the more complex your content is, the less suitable it is for MT. For large volumes of content, especially if it has a short turnaround time, MT is very effective. If accuracy is not vital, MT can produce suitable translations at a fraction of the cost. Customer reviews, news monitoring, internal documents, and product descriptions are all good candidates. Using a combination of MT along with a human translator post-editor opens the doors to a wider variety of suitable content. Which MT Engine Should You Use? Not all MT engines are created equal, but there is no specific MT engine for a specific kind of content. Publicly available MT engines are designed to be able to translate most types of content, however, with custom MT engines the training data can be tailored to a specific domain or content types. Ultimately, choosing an MT engine is a process. You need to choose the kind of content you wish to translate, review security and privacy policies, run tests on text samples, choose post-editors, and several other considerations. The key is to do your research before making a decision. And, if you are using a translation management system (TMS) be sure it is able to support your chosen MT engine. You can use MT on its own, but to get the maximum benefits we suggest integrating it with a TMS. With these technologies integrated, you will be able to leverage additional tools such as translation memories, term bases, and project management features to help streamline and optimize your localization strategy. You will have greater control over your translations, and be able to analyze the effectiveness of your MT engine. Four out of the five fastest-growing language services companies in 2018 are media localization specialists. The media business has seen a boom over the last two years, and traditional translation companies are taking notice. Media localization won’t stay an uncontested insular niche for long. In fact, conventional LSPs and technology providers are moving into this sector and expanding their technical capabilities this year. 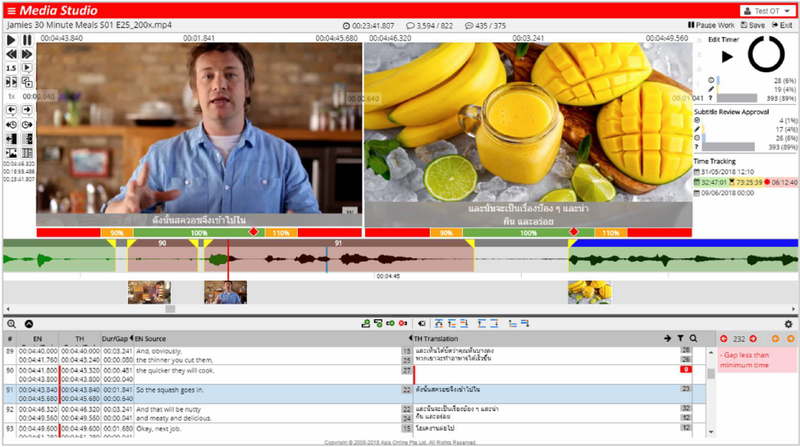 Omniscien, previously Asia Online, is best known for its trainable machine translation software, but now they are going into a new area – video subtitling. Omniscien has just started selling Media Studio, which was built based on product requirements from iflix, a Malaysian competitor to Netflix. Under the hood Media Studio has machine learning components: audio transcription, dialog extraction, and neural MT engines pre-trained for subtitles in more than 40 language combinations. The technology is able to create a subtitle draft out of a raw video already in the target language. It can even adjust timings and split long sentences into multiple subtitles where necessary. And it’s learning all the time. 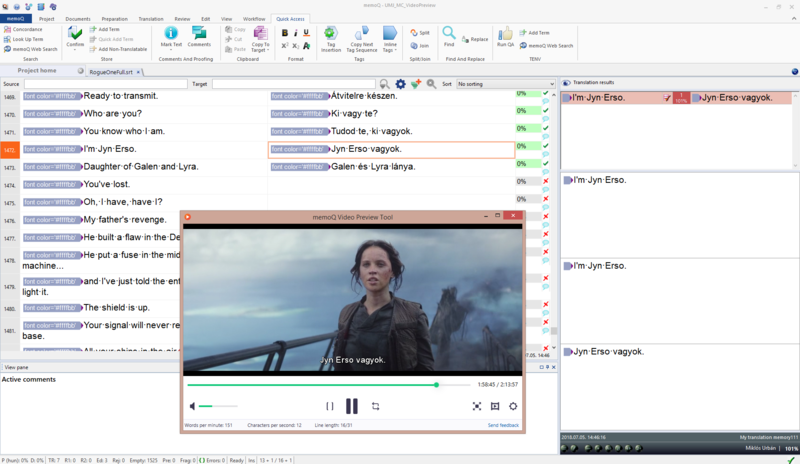 For the human part of the work, Media Studio includes a web-based subtitle editor and a management system, both including a significant range of features right from the start. Translators can edit time codes in a drag-and-drop fashion, skip parts of the video without speech, customize keyboard shortcuts, and more. Project managers can assign jobs and automatically send job notifications, track productivity, and MT leverage. The video is hosted remotely and is streamed to linguists instead of sending complete films and episodes. This adds a security layer for the intellectual property. No one in the biz wants the next episode of the Game of Thrones to end up on thepiratebay.org faster than it would on a streaming service. Linguists in low-bandwidth countries can download videos in low quality and with a watermark. On the downside, this new tool does not integrate with existing CAT and business management systems for LSPs out of the box, doesn’t have translation memory support or anything else that would make it fit as one of the blades in the Swiss army knife of LSP technology. According to Omniscien’s CEO Dion Wiggins, iflix has processed hundreds of thousands of video hours through the system since its inception in late 2016. By now, three more large OTT providers have started with Media Studio. Content distribution companies are the main target for the tool, but it will be available for LSPs as well once the pricing is finalized. The subtitle editor is a CAT-tool with an embedded video player. Translators using this platform can watch videos and transcribe them with timings, possibly with integrated speech recognition to automatically create the first pass. As they translate using translation memory and termbase, they are able to see the subtitles appear on the screen. The home dubbing is all about the setup on the voice-actor side. TransPerfect sends them mics and soundproofing so that recording can happen at home rather than at a local audio studio. 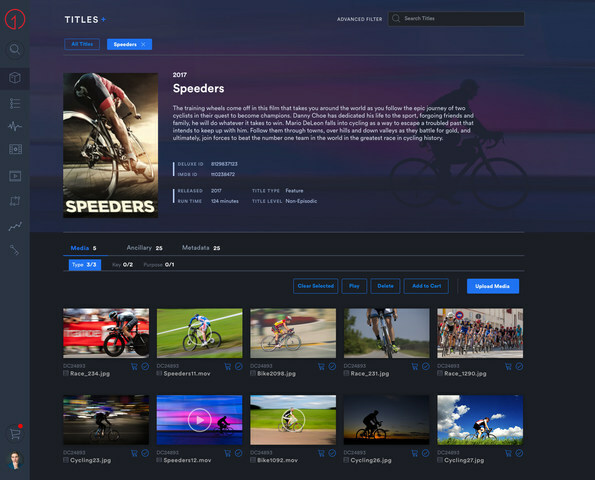 A media asset management platform stores videos at a single location and proxies them to the translator applications instead of sending complete files over the Internet, similar to Omniscien’s approach. The official launch of TransPerfect’s Media.NEXT is scheduled for mid-August. TransPerfect’s tech is proprietary, meant to create a competitive advantage. Media localization companies such as Zoo Digital and Lylo took a similar approach. They have launched cloud subtitling and dubbing platforms, but continue to keep technology under the radar of other LSPs. The idea of “dubbing in the cloud” is that it gives the client visibility into the actual stage of the process, and flexibility with early-stage review and collaboration with the vendor. The same idea permeates Deluxe Media’s platform Deluxe One unveiled in April this year. It’s a customer portal that provides clients with access to multiple services and APIs. At the same time, subtitling capabilities are beginning to make their way into tools that are available to hundreds of LSPs around the world. Popular translation editor memoQ has added a video player with a preview in their July release. The editor now opens the video file at the point that is being translated and displays the translated text so that translators can check it live. It can also show the number of words per minute, characters per second, or characters per line. A similar preview appears in Wordbee. The embedded video player can open videos from an URL, or play clips that are uploaded to the editor directly. The initial release includes a character limitation feature to keep subtitles concise, and anchoring: clicking on the segment with the text rewinds the video to that text. This is a step showing memoQ’s and Wordbee’s move deeper into media, and differentiating them from other TMS. So far, few TMS had video previews, one of them was Smartcat. 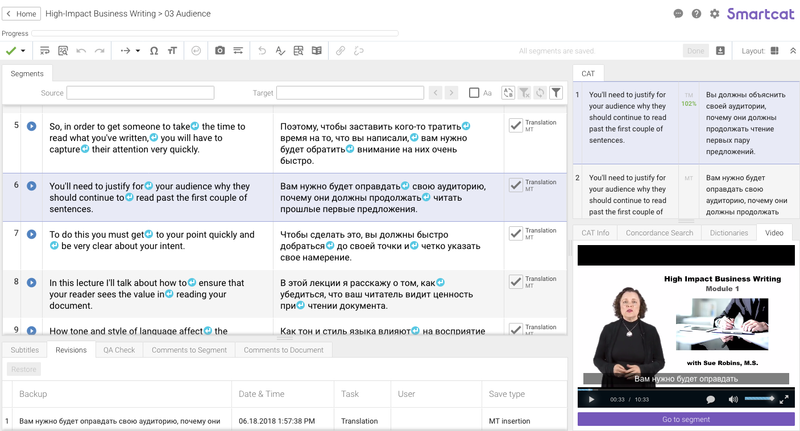 Subtitling functionality in Smartcat has been developed in 2013 for a special project, crowdsourced localization of e-learning platform Courserra. Today, users need to enable subtitling functionality on request. The feature set available includes a video player, timecode parsing, and anchoring. Subtitling user numbers in Smartcat are rising, according to product manager Pavel Doronin. Back to memoQ and Wordbee, their development teams probably will need to expand the list subtitling features over time: first of all, timecode editing. Moreover, memoQ and Wordbee support .SRT extension, whereas Omniscien’s tool supports TTML as well: a more advanced format that allows manipulating subtitle colors, position on screen and formatting. TTML might become more important for video on demand work and streaming platforms, for instance, it is the format that Netflix uses. Future “luxury” features could include character tracking with descriptions explaining their voice and preferred vocabulary, support for the speech-to-text technology, audio recording, etc. Subtitling is not new to the translation industry, and almost every mature CAT/TMS supports .srt SubRip text files. However, linguists have to run a third-party video player in a separate window to see their work. They also have to reload and rewind every time to see changes in the subtitles. That’s why in professional scenarios, subtitlers often use Amara, Subtitle Workshop, Oona captions manager, CaptionHub or similar specialized tools. These tools came from outside the language industry and didn’t support translation memories, term bases, and embedded MT. Previous attempts to create tools that combine the best of two worlds didn’t quite meet with commercial success. Years following the launch, user numbers for dotsub.com, hakromedia SoundCloud, and videolocalize.com stayed limited. So far, most language industry professionals viewed media localization as a niche service rather than as a growth area. As a result, they didn’t invest in specialized departments and software. But with video content increasing in share, and with media companies demonstrating record revenues, this might eventually change. However, by the time it does change, translation tools may achieve a “good enough” capability. Fast-forward 1-2 years – most LSPs might be able to subtitle without extra investment or training. It will become even easier to enter into subtitling and compete, leading to price pressure. Subtitling may turn into an even more crowded and low-margin space before you can say “commoditization”. Dubbing, on the other hand, is a different kind of deal. So far, the dubbing market has been dominated by larger companies such as Deluxe and SDI Media that provide voice talent in physical sound studios located in multiple countries. Perhaps one of the best examples of this would be Disney’s Let It Go which has been translated into at least 74 languages. Infrastructure for such projects is costly to build and maintain. Brick-and-mortar studios have high bills and need a constant flow of work to stay profitable. Projects might be hard to find for second-tier language outlets. To have a French studio overloaded and a Croatian studio suffering losses year after year is a realistic scenario for a network company. The virtual/home studio approach being used by newer players in this field such as TransPerfect, Zoo Digital and Lylo Media, is more scalable and provides acceptable quality for most clients. But will it be enough for high-profile content owners that award the largest contracts? If the home studio approach produces sustainable growth, commercial software vendors will jump in and replicate the technology, leading to lower entry to dubbing. However, if it fails over 2018-2019, instead M&A will become the go-to-market strategy in the media localization space. Watch out for smaller studio acquisition frenzy! SDL Trados 2019 is Here! Check the new features of Trados 2019 and stay tuned for our videos to go through the most important updates!